Four hours… four hours; for four hours I sat in the passenger seat of my mom’s sky-blue Honda Odyssey while she drove to Tallahassee. For four hours I gripped the armrest of my chair out of terror as my mother checked her email while driving, cut in and out of traffic, all while managing not to break her speed of 80 mph. I pray relentlessly to God for the day when it will be possible to just teleport to other cities. But this trip was almost worth the torture of riding with my mother, I was on my way for orientation at Florida State University. We arrived at our hotel around one in the morning. I had to work till 10:30 p.m. the night before so we couldn’t leave for the trip till I got off work, big mistake. If at all possible get the night before off, I was so dead when we arrived I didn’t remember how I ended up in the hotel bed when I woke the next morning. None of that mattered though, because I was finally there. I was at the University I had dreamt about for so long that was slowly creeping into reality for me. The campus is beautiful, every brick building fitting into the picture of a perfect castle before each visitors’ eyes. But the campus was more than just beauty; It was a symbol. 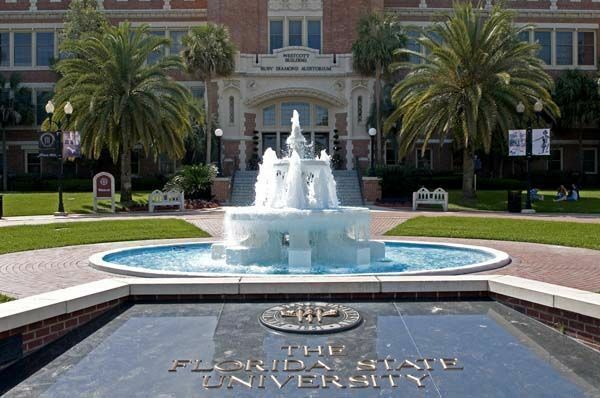 Florida State University represented change, on the title page of this new chapter in my life is the picture of its’ gates displaying the words “Vires, Artes, Mores” proudly for all to see. This was the start of freedom, the sacred “apron string cutting” ceremony, and the official end of childhood. The next three days I spent isolated from my family. My sole companions were my fellow travelers into the future and our orientation leaders. We learned where everything was, we heard standard campus rules repeated and repeated until we could repeat them ourselves, we learned to register for classes, we stayed in dorms, ate at the cafeteria, acted as college students in this pseudo-play of campus life created for us, and most importantly learned to do things for ourselves without mommy and daddy dearest. Some adapted better than others. I saw many companions fall when they couldn’t have mommy or daddy get them what they wanted…when they had to give into the system of survival of the fittest. I saw even more parents crushed in defeat when they weren’t permitted to attend their child’s advising session, see their kid’s financial records, help them create their schedule. It felt harsh at first, but it was reality and that’s what this whole trip was about. The three days on campus were created to show us the reality of the world around us and better prepare us, as to prevent us from falling victim to social Darwinism come August when this pseudo-reality of the orientation became true life. College trips tend to be fluffy campus tours and a light discussion of why you should choose their school over the plethora of others attempting to buy your affection, but this was so much more and I loved it.